Already a household name in her native Finland, Alma now has her sights set on conquering our shores with her tropical-tinged dance-pop. 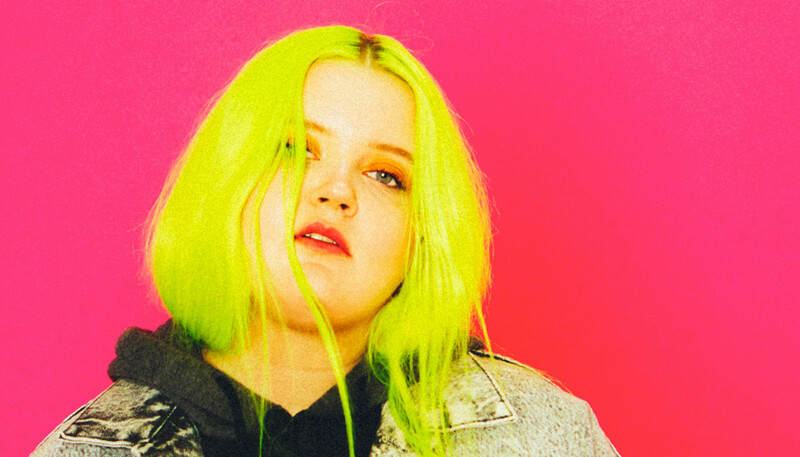 We sat down with the 21-year-old singer to discuss everything from talent contests and her as-yet-untitled debut to trashing airbnbs with Charli XCX and partying with The Weeknd. Your school careers advisers must have tried to dissuade you from a career in music, right? Of course. They wanted me to go to school, and I even went. But then, very early on when I first started putting music out, people discovered me so I dropped from school when I was 15 and started touring with a female rapper [Sini Sabotage]. I got money from that and I didn’t have time to go to school. And then you entered the Finnish equivalent of X Factor, right? Yeah, when I was 15 I did ‘Idols’. It was a funny thing: I didn’t like my school and I wanted to sing so that was the easiest solution for me, to just go there and see what happens. I didn’t have any expectations, I just went there and took it kind-of as a joke with my friends, but then I just kept getting through. And then after that I was kind-of famous in Finland. Were you a fan of ‘Idols’ before you applied? No and yes. When I was a kid I thought it was cool, when I was a teenager I thought it was absolute bullsh*t. But I started to understand that this is a very hard business to get into, and I didn’t have friends that played piano or were engineers or producers or that wanted to write with me. So after one year, I was just like, “F**k it: let’s do it.” You need to do a little bit of bullsh*t to get to do what you really want to do. I just took that risk, and it was a good thing that I did it because I think I wouldn’t be here now if I hadn’t. Sometimes TV talent shows force people into boxes. Did you find that, or were they supportive of your vision? Well, it’s a reality show; it’s entertainment. So of course they do a script from you – like, “You are the funny person, and this one is the shy person, and this one is the annoying person” – and of course they show the bits that they want to show. But I think they were very nice to me. They wanted me to be who I am. People often ask me if there was a point someone has tried to change my looks or whatever, but never. There has never been a situation where someone has said you should look like this, or wear this. I think if you have a very clear mind about what you’re doing, and you prove to people that this is the right way to do it, then who’s going to change you? That must stand you in good stead, working with major labels? Yeah. There are so many artists that are a bit lost. When I was 15 and went to ‘Idols’, I was lost and I didn’t know what to do. But now I’m 21 and I’ve been doing this for six years. Six years is kind-of a long time. I think I know what people want and I know what’s going on so I think people take me seriously. And I’m very honoured because I know there are so many – especially female – artists that aren’t taken that seriously. Tell us more about the music scene in Helsinki. The music scene is very small. We have a couple of “international” acts but I’m the most successful, and as you can see, I’m not that successful. So yeah, it’s very small. But I’m doing well, and people are very excited about me and my career has already helped some other acts. In Sweden, when they first got Icona Pop, then Tove Lo and Zara Larsson, it was way easier for people to get into international acts. Because people take you seriously and are interested, like, “Ok, she’s from Sweden – let’s go check her gig out.” But if you’re from Finland it’s a bit weird still. We have many local acts that are great, but I won the Finnish equivalent of a BRIT Award as this year’s “International Act”. It says a lot that I’m the only one at the moment doing this thing. Is there a sense of pressure that comes with that? How do you deal with that pressure? I just shut my brain off and I don’t think about it. Because I’ve thought about it and then I get very anxious. I’m just a little human being and if this is not going to work out then I’ll do something else; even though it’s a career this is still my life. So where are you at with your debut album? I just had a meeting yesterday about it. It’s coming... At the moment I’m all the time in L.A., writing. I’ve worked with Charli XCX and MNEK, and then there are many British producers I’ve worked with, like Mark Ralph. Big names are involved and, yeah, I’m overwhelmed. Even in L.A. people are very excited. I write all of my lyrics, of course. What is Charli XCX like to work with? Her Instagram implies she’s partying all the time but she’s also hugely prolific. That’s exactly what we did when I was in L.A. You know, I’m 21 and she’s 23/4 and we are very similar people. So I had a crazy house in the hills with a studio and she came there. We were doing sessions in the day time and then at night she just called loads of friends to come party. We trashed the house... It’s an Airbnb and we can’t get that Airbnb anymore. But it was good – we got great songs and we also partied a lot, and I think that’s a very fun way to work. When can we expect to hear the record, and what can we expect from it? I would say winter. Expect new sounds and more experimental things. You know, when you work in L.A. and when you work in the UK, and when you work in Helsinki, every time is a different vibe. When I’m in L.A. I’m working and the sun is shining and we’re swimming in the pool and drinking beers. Then there comes a certain kind of vibe when I’m working in Helsinki; it’s kinda dark. And you can expect some features, definitely. Some cool artists. Where are you looking for inspiration while you’re writing lyrics? Very much what I’m experiencing and what I feel. Everything. There are so many things going on at the moment in my life, and I’m 21 and I’m experiencing things for the first time so I’m in a confused situation. But yeah, the whole album is what’s going on in my head: when I miss my home and my friends, how it is being in L.A. at a party with celebrities. Who is the most famous person you’ve partied with? I’ve partied with Zara Larsson. And I was at the same party as The Weeknd. Finally, how has this tour been for you so far? You know what, I need to admit we’ve had f**king great shows, where people are dancing and screaming all the lyrics. It’s great. It’s a very good sign.